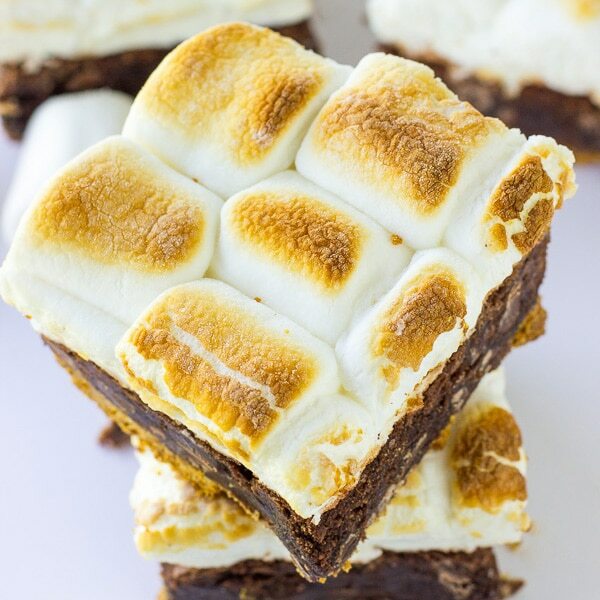 Nothing says summer like these S’mores Brownie Bars. These brownies taste just like a s’more and you don’t need a campfire to make them! They have everything you love about a traditional s’more. 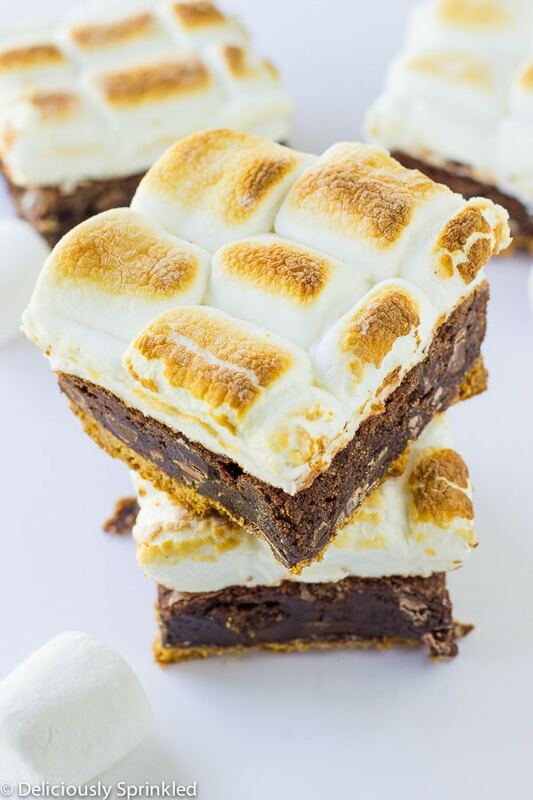 I don’t know about you but these s’more brownie bars sound even better than a traditional s’more. And with it already being June, summer BBQ’s are in full swing and these brownies are super easy to make and perfect for a backyard BBQ! ✓ GRAHAM CRACKER CRUMBS: To make these bars even easier to make, I used the graham cracker crumbs from a box. You could also place about 10 whole graham crackers into a food processor/blender, and pulse until the graham crackers are crumbled. 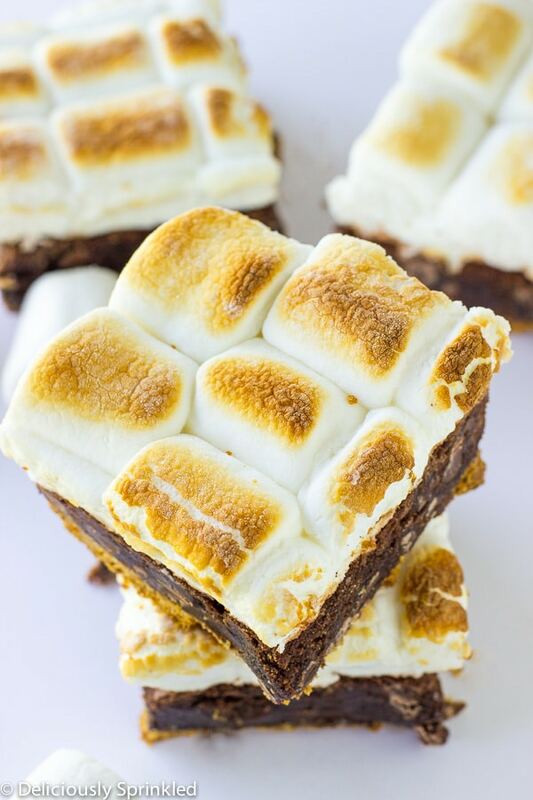 ✓ BROWNIES: I’m all about making things as easy as possible, so to make these s’more brownie bars I used my favorite brownie mix from a box. But if you want to make my recipe for homemade fudgy brownies. ✓ MARSHMALLOWS: When “toasting” the marshmallow topping make sure to watch the marshmallows through your oven door super closely so that the marshmallows don’t burn! Pre-heat oven to 350F degrees. 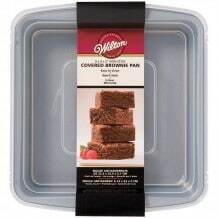 Line a 9x9 baking pan with foil and spray with non-stick cooking spray. Set aside. 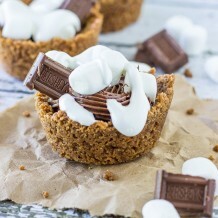 In a medium-sized bowl, mix together the graham cracker crumbs, sugar, and melted butter until crust forms. Press graham cracker crust into the bottom of the prepared pan. Bake for 15 minutes or until crust is lightly brown. Prepare brownie mix as directed on the back of the box. 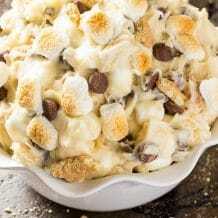 Stir in milk chocolate chips. Pour brownie mix on top of the crust. 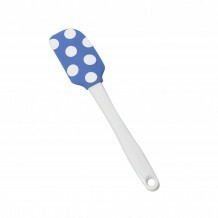 Bake for 30-35 minutes or until a toothpick inserted into the center comes out clean. Switch your oven to broil. Evenly top brownies with marshmallows (see Step 5 photo above). Place the pan into the oven, broil until the marshmallows just begin to brown. IMPORTANT: I highly recommend standing near the oven while you do this to ensure that the marshmallows do not burn, checking every 20 seconds or so. Heavenly! A lot of chocolate and gooey marshmallow in this dessert. Thanks for the detailed directions- my husband and son made them for Scouts & it was a favorite! Almost burned those dang marshmallows though. 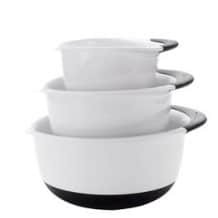 They placed them on the 2nd rung and broiled on low. Checked them 20 sec then every 10 seconds after. Delish!!! Delicious! Just made it for the 2nd time to bring to the office. The first batch had two different people declare them to be evil. I really need to make these! To me summer means s’mores haha. I love your posts and photos! Thank you. I have never used my broiler my oven is ancient. I will clean it first and then try it out! Sweets are seriously on my radar, lately it seem as if I can’t get through the night without something indulgent. I’ve exhausted all cookie, cake and ice cream options so these guys are looking pretty tempting!! 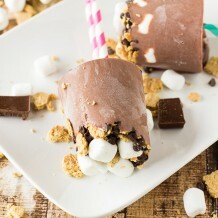 These look heavenly and those marshmallows looks amazinggg! Pinning!